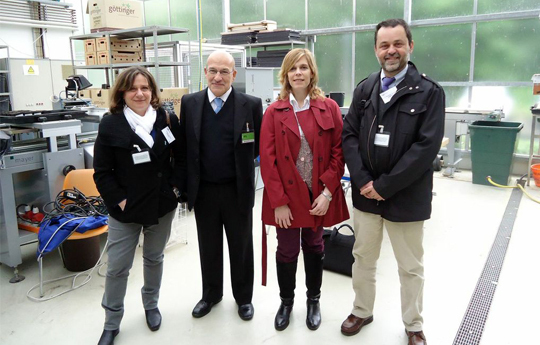 Argentine representatives travelled to Germany in an official mission on Bioeconomy to reinforce joint projects. The delegation. Photo: CONICET photography. The Fact Finding Mission on Bioeconomy took place from the 26th of May to the 1st of June and it summoned Argentine businessmen, members of CONICET and the National Institute of Agricultural Technology (INTA). The mission was organized by the Argentine-German Chamber of Industry and Commerce, jointly with Ministry of Science, Technology and Productive Innovation of Argentina. The comprehensive programme of the meeting aimed to strengthen scientific and technological bonds between both countries, evaluate technology transfer opportunities, optimize the Argentine-German cooperation to promote new contacts and enable bilateral projects in the field of Bioeconomy. According to Alejandro Mentaberry, Executive Coordinator of the Scientific and Technological Cabinet (GAGTEC) of the Ministry of Science, Technology and Productive Innovation of Argentina and principal investigator at CONICET, “We have a long tradition of cooperation with Germany, and in the field of Bioeconomy we are interested in establishing direct contact with the institutions that work in that area in order to develop joint projects” . The work meetings were carried out in different places of Germany. The delegation visited the Technical University Munich, Fraunhofer Institute for Biotechnology Innovation, BRAIN Biotech Company, Jülich Institute, Clusters BioTop and Norgenta and the Max Planck Institute of Plants, among others. The exchanges show the remarkable bond already established between both countries. Consequently, two compromises were fixed to implement an action plan to implement the results in a long and short term. Thus, Mentaberry also explained that “For us, the importance of this meeting lies in the fact that in our country the agroindustrial field is one of the major economic areas”. The main subjects discussed were animals and plants genome sequencing, Biotechnology applied for human health, the use of Biomass for energy generation and other chemical byproducts. Thus, a list was drawn up with developments and investigations of mutual interest to assess areas of possible technology transfer. “Particularly, we are interested in all related to biomass processing for production of bioenergy, chemical intermediates and new materials. As regards this, we were in contact with two or three institutions that have a leading role on this matter”, Mentaberry, who also mentioned the importance of this context in soil care, added. “It is not plausible to think a bioeconomic development model without considering soil conservation. That is why we want to work from Ministry to Ministry with high-impact areas”, he concluded. – Alejandro Mentaberry. Executive Coordinator of the Scientific and Technological Cabinet (GAGTEC) of the Ministry of Science, Technology and Productive Innovation of Argentina and principal investigator at CONICET. – Raquel Chan. Director of the Science and Technology Centre of Santa Fe and principal investigator at CONICET. – Claudio Salomon. independent investigator at CONICET. – Andrea Gomez Zavaglia. independent investigador at CONICET. – Julio Menendez. Consultant. INTA. – Eduardo Orti. R&D Manager at Amega Biotech. – Dorothea Garff. Investments and Sustainability manager of the Argentine-Germany Chamber of Industry and Commerce. – Teresa Behm. Technology and Innovation Coordinator of the Argentine-Germany Chamber of Industry and Commerce. – María Florencia Giacchi. Officer at the Technology Transfer Office of CONICET.